I hear so many people complain about going to the gym. There are a thousand excuses made every day by people who want to get healthy, who want to get fit, but go to the gym and do stuff they hate. They slog along the treadmill for mile after mile, hating every step. They use weight machine after weight machine, entertained not by the exercise but by the thought that they’ll be able to end the boredom sooner rather than later. The number one rule of fitness is pretty simple: If you don’t like what you do, don’t do it. Would you play a video game you hate over and over again? No, you take it back to Gamestop and trade it in for a better one. Would you eat the same thing for breakfast every day if you hated the taste? No, you’d cook yourself something better. Then why would you spend hours on the treadmill if you hate to run? Why would you use every machine in the gym if you hate using isolation machines? Why would you attend daily pilates classes if you prefer cycling? See my point? If you don’t enjoy what you do, don’t do it. 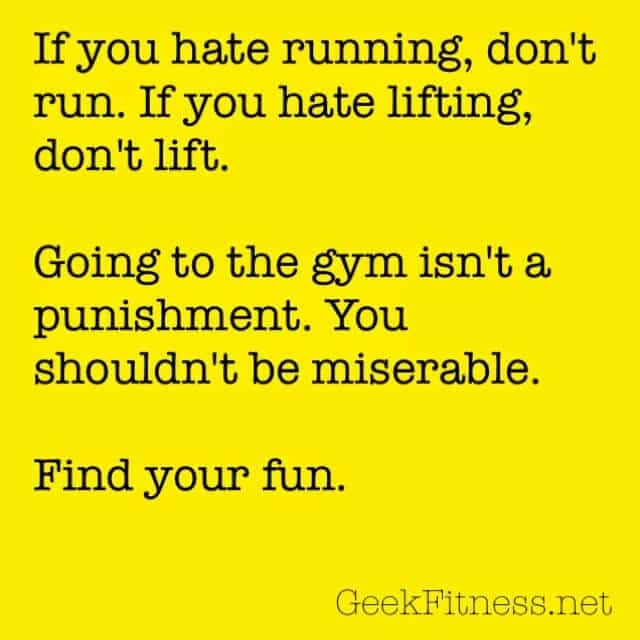 Fitness should be fun, not a punishment. If you hate everything about exercise, then you’re doing something wrong. Not every activity is right for every person. Experiment a little, try some new things, and see if you can find your fun. It may take a while, but believe me, when you find that activity that clicks, working out won’t feel like work at all. Amen to this! It took me a while to realize it too. But I finally found my “fun” in tennis! I still do weights, walk and elliptical and even a bit of swimming every now and then but all of these are not “work” to me. Running is not my thing and it took me a while to realize that why am I doing it if I hate it! Tennis was the same way for me. It was one of my first activities that got me out of the house and moving around a lot. The main reason it didn’t stay at the top is because I couldn’t just walk out my door and do it alone, which is one of my favorite things about running. But I am right there with you! That’s exactly what I mean–your bigger picture involves the gym, where there is the chance it couldn’t. It might be hiking or swimming or even bodyweight stuff. Even if we trudge through parts of what we do (and believe me, not every mile as a runner is lovely), the overall atmosphere is one that I enjoy. I don’t like gym culture too much, so I tend to gravitate toward more outdoorsy and social sports that benefit me in the same ways. Still doing strength training, for example, but maybe not on isolation machines.